1. Applying to med school is expensive and time intensive. It’s hard to know where you might be a competitive applicant if you don’t know how your scores compare to other students at a school. Your practice scores might give you an idea, but actual scores can be very different. You can base your school choices on your GPA alone, but that doesn’t give you a complete picture either. 2. Resting your future education and career on a future MCAT score makes the MCAT exam itself more stressful. For some applicants, this stress alone could negatively impact their score. For others, unforeseen circumstances might affect your study or focus, with disastrous consequences. It would be a shame to put in all that effort and then bomb the test and risk rejection. 3. Even if you submit your application early, a late MCAT score can quash that advantage. Some schools won’t look at an application until the MCAT score is submitted. Seeing “MCAT score pending” might send your application to the bottom of the stack until it’s ready to be reviewed in full. 4. If you are retaking the MCAT, ask yourself if you want the schools to make their decision based on your existing score. Although you’ll notify them of your scheduled exam date, the application package in front of them has your current score and will shape their initial impression of you. I recommend taking the MCAT, getting your score, and then applying early in the next cycle, rather than going through the stress of submitting an application with an unknown MCAT score and then taking the test under pressure. Far too many candidates assume they’ll excel on the MCAT, only to find that testing day pressures negatively affect their scores. Since you know that the results will be used and weighed heavily, regardless of how you performed, it makes sense to wait. If, however, you do decide to apply to med school before you’ve taken the exam, then I recommend the following: Apply only to schools with less competitive programs, those that you think you have a good chance of getting into with, say, the lowest score you think you may get. I would even go further and say to apply for just a single program – that’s all you need to start the AMCAS verification process – until you know for sure. You can always go back and add more schools later, and once your application has been verified, there is no delay. Worst case scenario – you don’t score well and have to wait and apply again next year. Not the end of the world. The final word on this is that you know yourself best. If you think you can apply before taking the MCAT without the stress killing you and knowing that if you bomb the exam, you’ll bomb your chances of admission, then go for it. But if in doubt, take the extra time and submit when you can present the best application possible. Medical school is so competitive. You owe yourself the very best shot. Are you seeking the competitive edge that only one-on-one consulting can get you? Explore our Medical School Admissions Consulting services and get the leg up you need to get ACCEPTED. 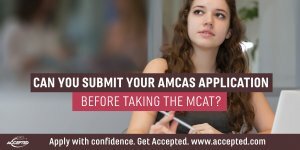 • Is Your AMCAS Application Ready?